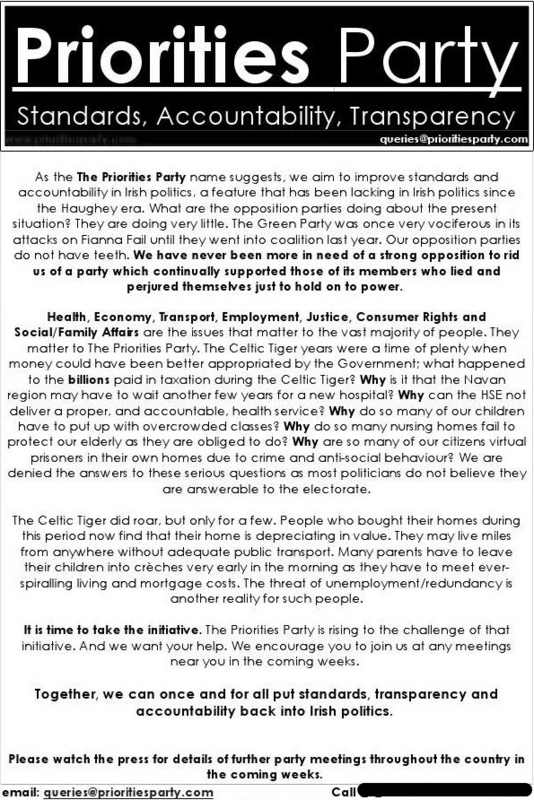 From 2008 a leaflet from the shortlived Priorities Party. Founded by former Green Party Member Leo Armstrong and Fine Gael member Florence Craven, they started out with the best of intentions. Alas its very hard to start a New Party and make an impact. In this leaflet they did though reflect the anger of many and this was before NAMA, the Bank Bailouts , cutbacks and so on. As the party name suggests, we aim to improve standards and accountability in Irish politics, a feature that has been lacking in Irish politics since the Haughey era. What are the opposition parties doing about the present situation? They are doing very little. 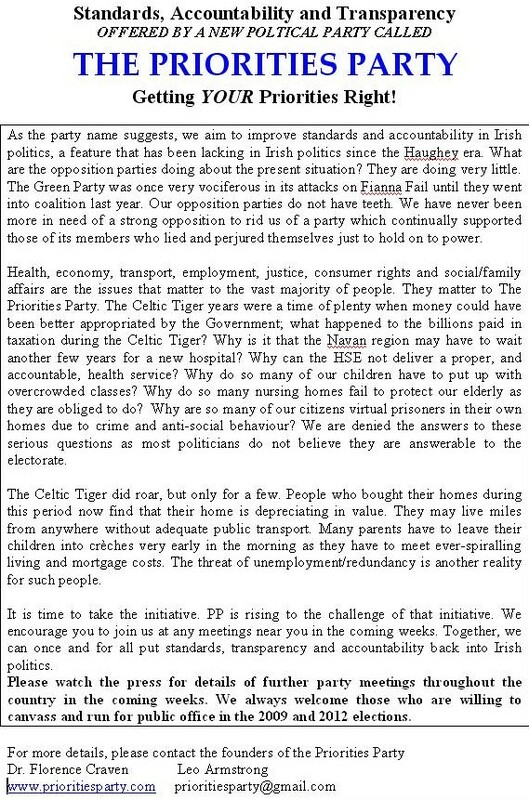 The Green Party was once very vociferous in its attacks on Fianna Fail until they went into coalition last year. Our opposition parties do not have teeth. We have never been more in need of a strong opposition to rid us of a party which continually supported those of its members who lied and perjured themselves just to hold on to power. Many thanks to the donor. The Priorites Party (known also as the The Peoples’ Accountability, Transparency and Standards Party?) were short lived, one of the founders Leo Armstrong is listed as an Independent in the 2009 Local Elections in Clane, although I don’t know if he was standing for the Priorities Party or not. The party is now defunct. I have another leaflet from them posted HERE.